Or you can go up Norwest Bay Road to Gowland, turn right and follow this up to Reeves Rd. (this is a gravel road and becomes very rough - you may need to park and walk or ride up from there). Reeves will take you right up to a trail into Big Tree. Finally you can access the Wakefield Creek Matrix trails via the Halfmoon Carlson Forest Service Road which is about 8 km along Hwy. 101 and 400 metres before you get to Trout Lake. Turn right up the road and follow it approx. 2.4 kms until you get to the parking lot for Big Tree. Big Tree is home to some of the largest old growth fir trees left on the Sunshine Coast. There are other access points to the Wakefield Creek Matrix trails as well, but these are the main ones. Built in 2011, 3D is a beautiful, heavily forested trail that follows along beside Wakefield Creek and connects between DD and ends at Duracell. Much nicer route than the power line/gas line road. 4D is the newest trail in the Wakefield Matrix and only just completed as of November 2012. Nice and loamy, with several boardwalks to keep you off the slippery, clay based trail. 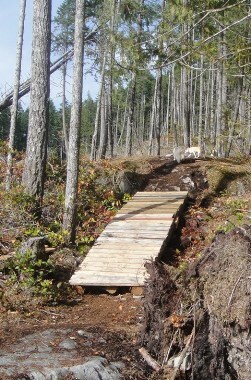 Great trail work by the West Sechelt trail elves. This trail basically picks up where 3D ends and connects over to the dirt road (Reeves) at either Addernach or a little lower down. Addernach starts near Crowston Lake and ends way over at Lee's Big Easy, with a stretch of logging road in the middle. The piece that joins Lee's Big Easy is particularly nice as it drops down into deep forest and across a stream. There is a freshly logged area that you can see from the trail, but there is a buffer of trees. In relation to other trails in Wakefield Creek Matrix, this trail is on the difficult end of the Intermediate rating. Muddy a good part of the year (except summer), this trail connects you from close to the Parbac trail at Crowston Lake and off the forest service road that runs straight along from the Big Tree parking lot to the far side of the Beaver Pond and out to the other forest service road spur. Brings you out close to the entrance to Skullduggery. The Big Tree trail is a popular hike in the Wakefield Creek Matrix. It is a wide, gravel path that takes you to a couple of big fir trees and then beyond. Meant to be accessible for wheelchairs. Picnic table and outhouse facilities. Parbac and Shakecutters connect to this trail. In relation to other trails in West Sechelt, this trail is very easy except the piece that continues after you get to the picnic table. The Brat trail is best ridden downhill, but can be hiked either direction. It is fairly long and has a lot of hill so riding it downhill is fun, but not so fun climbing it. Take the Telus Road to the trail head. Frogger will connect you to the Telus Road or you can get there off of the Halfmoon Carlson Forest Service Road Branch 2. Beautiful trail through equally beautiful forested area. Brokebac connects Parbac over to Dropbac. One of the newer trails in the Wakefield Matrix, it is a relatively flat and easy route. Typical Westcoast trail with roots and rocks. Challenging trail that allows you to "bypass" some of the most difficult parts of Rock'a'Billy. Takes you out to the forest service road where you can turn right to get to the mine site and West Sechelt or left back to the road that you turn left on to get back to Beaver Pond. This is a fairly long trail in the Wakefield Creek Matrix that connects Shakecutters to the powerline down closer to the Halfmoon Bay end. It drops from Shakecutters to the powerline and there is a tricky switchback area. This is a beautiful trail that skirts the hill and provides panoramic views of the mountains, Crowston Lake and the straight of Georgia. Pretty easy riding and hiking with minor climbs. Takes you past Desoto Rock which has been bolted for climbing. Once you pass the rock you head back into the trees and head downhill through a wet area and back out onto the forest service road. Go right to head back to Big Tree and Beaver Pond. One of the newest trails in the Wakefield Creek Matrix, the trailhead is just about 50 paces up the road from the trailhead for Scatterbones. It is very hard to find right now as this trail is just being built. It is pretty rough and has some rock faces that are pretty slippery. I've just put it in as a black dotted line for now. At the moment it pretty much ends at the dirt road above, but it is going to carry on from there. Dogtown is one of the possible names for it. Nice views from the top. Dropbac connects from the end of Brokebac over to Addernach. This is a beautiful trail that has a few nice views out over the Strait and towards West Sechelt. Fairly smooth, easy trail. The easy end of the Intermediate rating. This trail has two parts. The first part can be accessed off Reeves Rd. off Gowland and up either the powerline road or the logging road further down Reeves closer to where Gowland turns to Reeves. The second part joins Shakecutters to the powerline. Skullduggery comes into Easy Street about half way along. If you go right, you will travel over some boardwalks and small bridges and come out onto another forest service road spur. Left on Easy Street takes you past the clear cut area, back into the trees and onto Over Easy. This is one of the very newest trails in the West Sechelt Matrix and one of the few recent trails that wasn't built by Brad Proctor and friends. It is a downhill trail with the lower portion off the logging road complete. It intersects with Dropbac rather abruptly so be cautious or you'll end up in the bush on the other side of the trail. The upper portion is still being built and was unfinished as of November 2012. UPDATE (Dec. 2013) - Lower portion of Frogger has recently been logged and the trail has not been rebuilt (as of Dec. 29, 2013). At the moment it is impassable. Frogger is another trail that is best ridden downhill, but can be ridden uphill if you feel like a climb. My preference would be to access it off the Telus Road and ride it down. Again hiking is good either way. Lee's Big Easy connects just off Reeves Rd. to Addernach. Trail is fairly easy except for a ramp and boardwalk area. Also it is a steady climb, although not steep. This trail takes you behind the Beaver pond and connects to the Beaver Pond trail which comes in off of the main forest service roads that run either side of the Rec area. At times throughout the year it can be a bit muddy. Without this trail we'd be forced to ride or walk through the beaver pond which is getting bigger and deeper all the time. This trail branches off Rock'a'Billy to the right. The trail travels across several really mossy rocks and is quite beautiful! Near the top it forks with one fork connecting over to the spur road just northeast of Crowston Lake and the other fork takes you over to the logging road about 1 km southeast of Crowston Lake. It is a very challenging ride compared to other Wakefield Creek Matrix trails, with lots of crazy, steep downhill, particularly the new fork to the southeast. Over Easy is an easy trail to ride in relation to other trails in the Wakefield Creek Matrix other than the hill. It is fairly short, but the climb is a bit steep, but doable. It connects to Brat and Desoto. This trail connects Big Tree over to VFR and Crowston Lake. Fun, relatively difficult trail for riding compared to other trails in the Wakefield Creek Matrix, but a moderate hike. Last year the Capilano University Mountain Bike students worked on this trail, but unfortunately part of the trails has just been logged. It is now (May 2011) open again after being closed for a couple of months. This trail is tricky to find. There are no signs for it at either end so finding it is not easy. Best access is to take one of the Beaver Pond trails from over Big Tree way out to the forest service road. Turn right and follow the road past the road that cuts off to the right and the one that enter from the left. Keep going about a half kilometre or so, keeping an eye out on the right for the trail head. It is small single track so not obvious til you are almost right on top of it. It is a fairly difficult ride compared to other Wakefield Creek Matrix trails with steep, rocky sections. You will see Bypass trail on your left and a little further on a new trail that goes off to the right called No Modifications (see below). If you ride it to the end you will pop out onto another forest service road spur. Right at that point will take you down to the mine site to Mason Rd. and Heritage Rd. Left will take you back to the forest service road that you were on when you entered Rock'a'Billy, and left here back to Beaver Pond. This trail is a great way to avoid the most unpleasant part of the gravel road. It winds through the forest and is pretty dark and gloomy on a cloudy day, but I bet it's nice on a hot, sunny day. Not too difficult with just some roots along the way. The most westerly access to this trail is .8 km up Gowland/Reeves from the corner of Mason in West Sechelt. There is good parking and then go left a short distance up the dirt road. Shakecutters trail actually follows an old access road into the area where shakecutting occurred in the past. Fairly easy trail for riding and hiking, but it can be very wet at times with lots of big puddles and muddy areas. Main connecting trail in the Wakefield Creek Matrix with several trails forking off of it. Skullduggery is the first trail of a series that you will likely want to ride together - Skullduggery, Easy Street, Over Easy and either Brat or Desoto. Nice single track with bridges, roots, and some climbing. Short connecting trail between VFR and the old grown over logging road to Crowston Lake. Turn left to get to Crowston or right to Addernach. A bit of a rough ride and very narrow. VFR is a long trail with lots of climbing no matter which direction you come from. It can be accessed off Parbac or from Adernach. Either way expect to climb and then expect to descend. Part of the trail was recently logged, but was restored by some of the Capilano University Mountain Bike students and is now reopen for use. Click here to return from the Wakefield Creek Matrix to the Sunshine Coast Trails Home page.